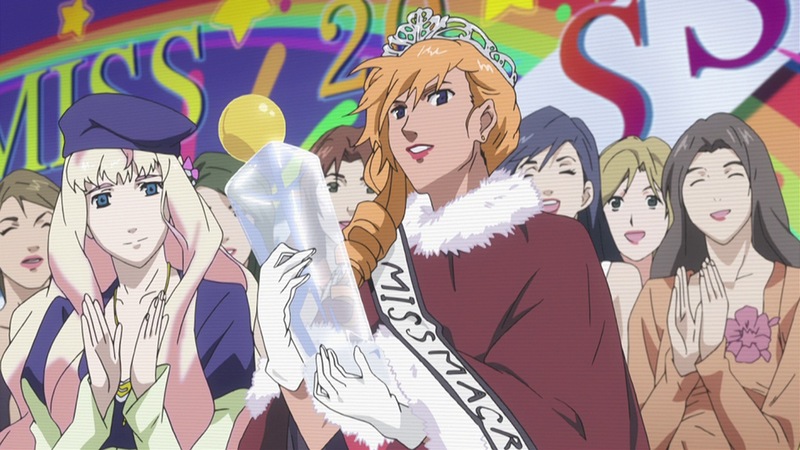 ← Gundam 00: from international to intergalactic relations? 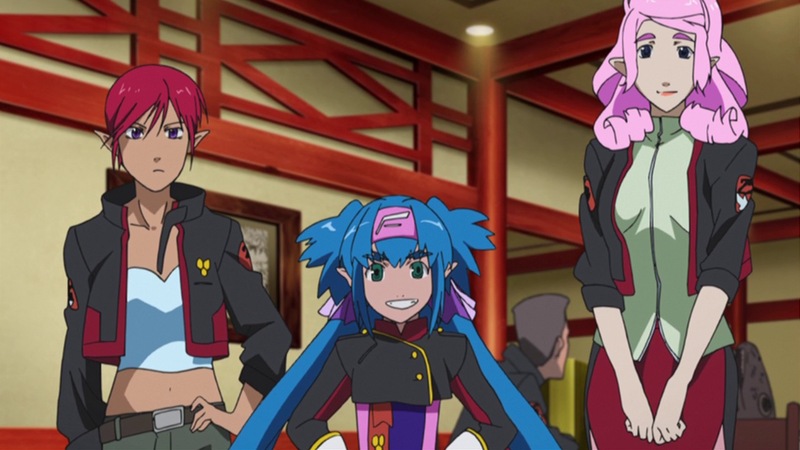 with Konishi Katsuyuki (Ozma), Nakajima Megumi (Ranka) and Yoshino Hiroyuki (Series Composition). In case anyone is wondering, Yoshino isn’t the same person as the seiyuu Yoshino Hiroyuki. Yoshino: After Kawamori approved this, I knew that any other tributes would be fine too. Konishi: Well, I’m a Macross fan – I’ve seen the first series several times – and fans just grin at these references. But even if you’re not a fan, you’d just think it’s pretty cool. Nakajima: There is something about it, isn’t there? Yoshino: Did your heart skip a beat when (Ranka) was saved by Alto? Yoshino: So I asked him: “Er, (Director), do you mean I should fix it?” And “Yup” was his answer. 07:30 The swimsuit part of the pageant. Yoshino: Ah, true, a woman wouldn’t do that. Nakajima: not in front of people. But even in private, I wouldn’t do that! Yoshino: was there anything else you noticed? Konishi: And after that, Alto was called out too, though by SMS rather than public announcement (as Ichijou Hikaru from the first series was called out). Konishi: But Frontier really feels like a new work. Nakajima: I think so too – rather than “Ah, it’s the same here”, it’s more like a “perhaps that was…?” kind of feeling. Konishi: For that scene, Miss Macross, there was something that struck me as being different…Minmay and Ranka had different contestant numbers! Yoshino: Well, as expected, I don’t remember that kind of detail (laughs). Konishi: I only realised it later, when I watched it again myself. But it was fun going back to watch the first series to see what was the same, to see how far you took the references. So everyone, please try doing that yourselves, ok? Try it, ok? Yoshino: I heard that the person who animated it did the dance him/herself, and videotaped it for reference. Konishi: Ah, I want to find out for sure! Konishi: so there is a Queadluum series, but each unit has a different name? That’s sooo much detail! I really want to see the contextual materials for this. Yoshino: There is an incredibly detailed book with all of this, I think. Nakajima: Ah, I really want to see that…I mean it, I want to see it, (Director) Yoshino. Nakajima: Ah, next time then. Nakajima: I sounded more mature in the TV series because I was mimicking Minmay’s version, having listened to it a lot. But after talking with Kanno Yoko, we made her sound more like an idol for the CD…which was recorded around February 2008. We made her sound like one of those idols from the past. Konishi: I’ve been wondering, how did you decide on “My Boyfriend is a Pilot”? Konishi: So that’s what happened! Yoshino: After that, the director and everyone were unstoppable – “If Akane-kun says so, we’ve no choice, really”…so we asked Kanno to make a new arrangement, and got you to record it, which gave us this scene. So it had nothing to do with me, but I’m now quite thankful to everyone who made that possible! 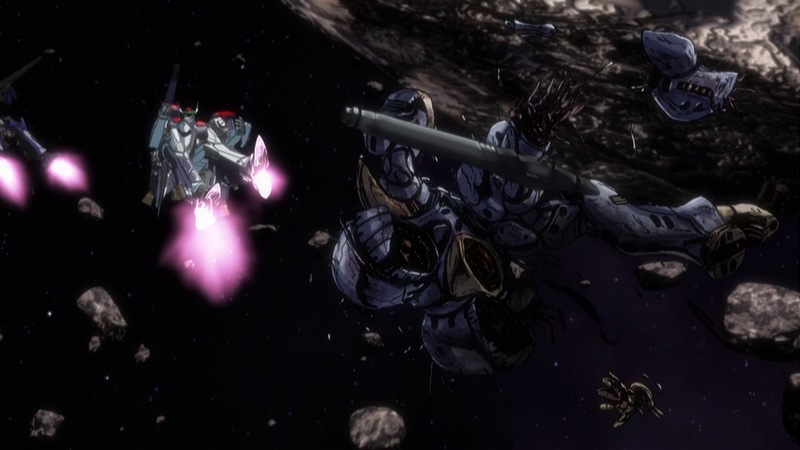 Like, having the songstress’s song juxtaposed against a battle is what Macross is all about. Konishi: That really is something you’d want left behind, recorded for all time, as a fan. Yoshino: so, as the writer, I’m really grateful for that. Nakajima: Me too. Very grateful. I’m glad I got to sing it. Yoshino: And why are YOU putting on airs as if you were the one responsible for it? (raucous laughter) And what other songs are you hoping to sing? Nakajima: Hm…there are lots of songs…what do I want to sing most? I really like “My Beautiful Place”, so I’d love to try singing it. Konishi: If you say it (here), you just might get to sing it. Yoshino: Well, maybe not in the series, but we might release it in an album or something. Nakajima: Really? Then, “Silver Moon, Red Moon” and “Shao Pai Lon” please. Yoshino: Did you hear that, Sasaki? Yoshino: here we have Klan Klan again. Konishi: Who came up with the idea of making micronised Klan a loli? Yoshino: Here here, it was me (^o^)! Konishi: So it was Yoshino. Because “moe” is better? Yoshino: I actually brought it up as a joke as some informal meeting, like this Zentran body, but this when she micronizes, she’ll be a little girl. I really meant it just as a joke. Konishi: But she really does have a fantastic body in her Zentran form. [Yotchin than interrupts the commentary to draw attention to Klan’s entrance. Konishi: there are lots of little details we don’t know about huh? What’s you’re favourite? Konishi: Well…I don’t think Klan steals the show, but all I could think at the time was “just how much damage are those two doing to the restaurant?”! 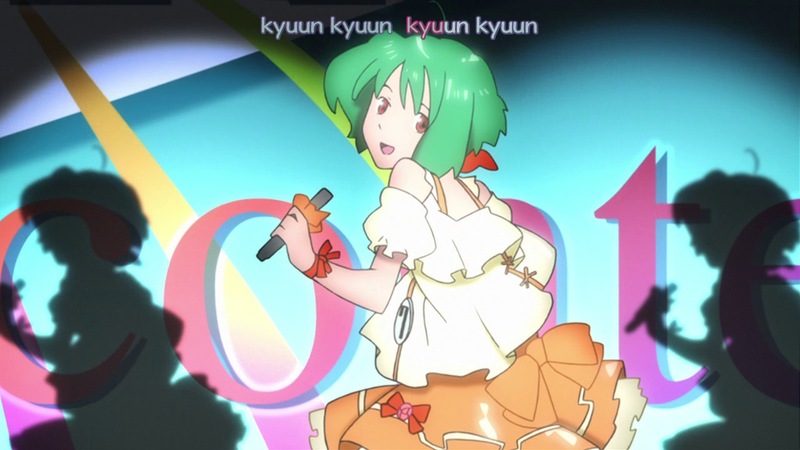 Konishi: aren’t you glad that Ranka wasn’t on the screen here? Konishi: I mean, if she was, wouldn’t it feel somewhat…lonely? Nakajima: No…it’d be way beyond that. Konishi: but it was difficult, wasn’t it, at that time, to get into Ranka’s head, to try and understand how she was feeling? Nakajima: It was, quite. At that time, I didn’t really know about recordings, and I was still doing them alone, so I couldn’t ask anyone for advice either. Konishi: and that’s why, at the start, you often just observed from your own seat. (Yup, that’s right). But in a way, wasn’t that good? Being able to observe everyone. Konishi: and you could observe all the directions and corrections that (sound director) Mima gave, and bring it to your own performances. Nakajima: Yes. I’m really glad I was able to think at the time. Konishi: So what’s the best thing about episode 4? Nakajima: Let’s try again – what’s the best thing? Yoshino: Then it’s got to be “My BF is a Pilot” juxtaposed against the battle. Konishi: especially those two hearts drawn in the sky. Konishi: they clearly had two of them, huh? Yoshino: I laughed when I saw that. I hadn’t written it, but that’s what the animators drew. Konishi: what detail, huh? I was really surprised! And…how about you, Megumi-chan? Megumi: Klan Klan (Eh?) But really! I was looking at Klan’s character, watching Toyoguchi voice those two sides of her, so it made a really big impression on me.